The Pactron “V” Series QPI Software Development Platforms (SDP) are a complete QPI validation environment. It consist of a Romely or Grantley server, Pactron’s in-socket QPI-FPGA Accelerator Hardware Module (AHM), Intel® Quick Assist Technology and Altera Open-CL software. Pactron is a QPI licensee; Pactron can provide all Intel licensed QPI and Intel® Quick Assist Technology with their products through end user license agreement. This allows users simplified accelerator integration and development paths to accelerate design productivity for Medical, High Frequency Trading (HFT), Defense, ASIC development, and other Data center applications. 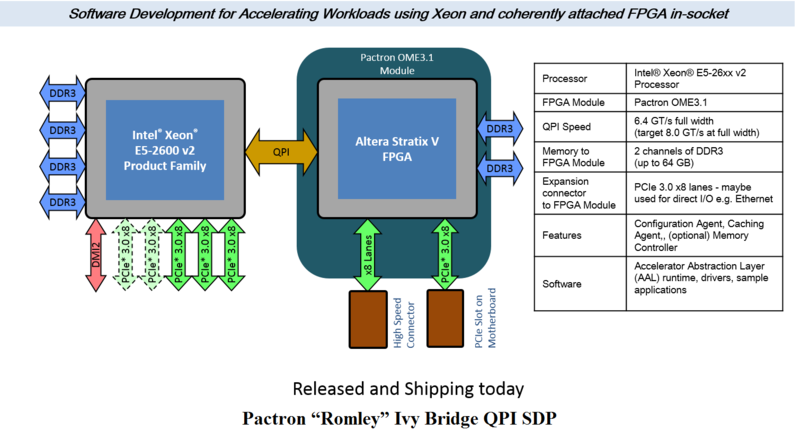 The Pactron QPI-FPGA AHM can connect to the rest of the platform in 2 different configurations; Caching Agent (CA) or HA with on-chip RAM. These configurations are ideal for designers of low-latency, signal-processing, packet processing and embedded applications, such as high-frequency trading and big data that need higher computation performance-per-watt than traditional CPU configurations can deliver. Pactron customers can accelerate design productivity for QPI and other Applications by taking advantage of the design services offered by Pactron and its partners. Pactron is a provider of Electronic Design & Manufacturing Services, supporting clients across a broad range of industry segments. Pactron designs and develops comprehensive and robust embedded systems that provide storage, wireless, mobile, networked, audio video, and Internetconnectivity for OEM markets. Pactron delivers integrated hardware and software platforms that are incorporated into end to end solutions, providing its customers minimized risk, accelerated time-to-market, reduced development costs, and enhanced design architecture.